4Videosoft iPhone 4S to Mac Ultimate 6.0.8 無料ダウンロード - Transfer iPhone 4S files to Mac and iTunes, backup iPhone 4S SMS and contacts. 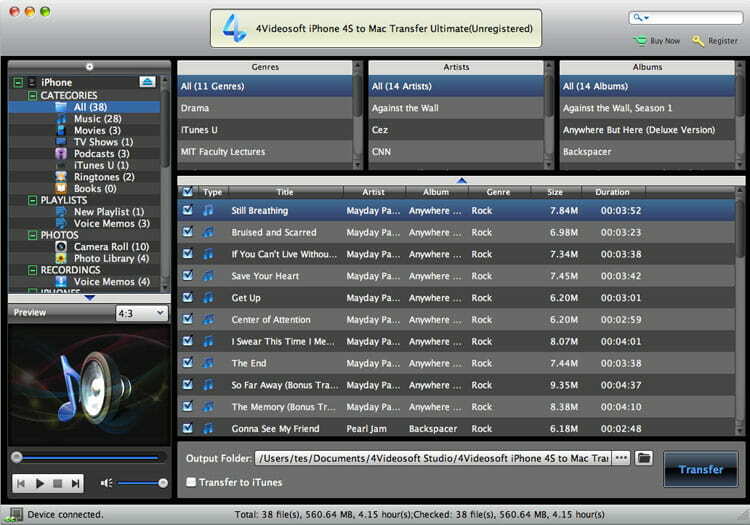 4Videosoft iPhone 4S to Mac Transfer Ultimate can transfer TV shows, podcast, voice memos, iTunes U, ePub, PDF, audio books, SMS and contacts of iPhone 4S to Mac. Additionally, The iPhone 4S to Mac Transfer Ultimate is highly compatible with all Apple devices, like iPhone 4, iPhone 4S, iPhone 5, iPad, iPad 2, iPod, etc. And this software supports the newest iOS 6. 4Videosoft iPhone 5 to Mac Transfer enables you to transfer any iPhone 4S file to Mac directly without missing. This iPhone 5 to Mac Transfer can be used to transfer iPhone 5 files to iTunes as database. This iPhone 5 to Mac Transfer is your best choice to transfer files from any Apple devices to Mac. This 4Videosoft iPhone 4S to Mac Transfer Ultimate software is able to recognize all information about your device on the main interface, such as iPhone 4S picture, type, capacity, version number, serial number and format. This iPhone 4S to Mac Transfer can help you find the file you want quickly with the "Search" function. It also can count the transferred files (succeed and failed) automatically. It is easy for users to use iPhone 4S to Mac Transfer with super fast transferring speed.